For hot air balloon rides to take place at all, the local weather must be on our side. Ideally we are looking for light surface winds and stable air conditions. Calmer air is usually found at dusk and dawn, so that's when we fly. The balloon launch times will vary according to the season, and with each passing season comes stunning changes in the colours of the landscape. Having arrived at the chosen balloon launch site and met your fellow passengers, your pilot will gather together the lucky ones who will be flying and begin a thorough pre-flight brief, answering any queries you may have. 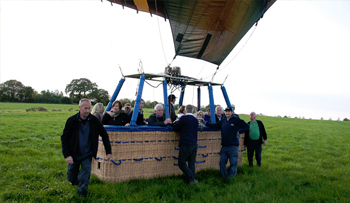 Check Dates check our forthcoming balloon flight dates now. 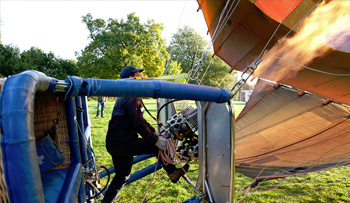 The hot air from the balloon's burners is used to create lift and inflate the balloon ready for flight. Formalities aside, it's then time to prepare the balloon. 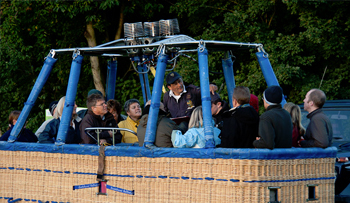 Inflation is one of the most exciting aspects of the ballooning experience. You may be invited to assist with the inflation and watch in wonder as the colourful balloon billows as it fills and expands with air. 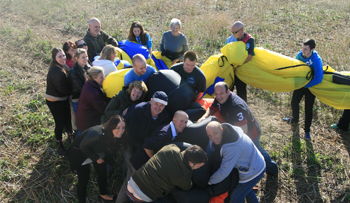 Once everyone has climbed aboard and the balloon is fully inflated the pilot will complete the final checks. When your pilot is happy to launch the balloon he will release the tethers and your flight will begin. The air balloon will gently rise as your voyage commences, nobody knows where they are going, and for once, it does not matter!! The basket seems almost stationery, the ground falling slowly away as the spectacle of the flight begins to unwind for you. You will rise into the air and gently float on the breeze over trees and buildings, high above the fields and rolling hills of the English countryside, suspended in a woven wicker basket beneath a big, beautiful balloon. Meanwhile on the ground the balloon crew will have packed away and started following the direction taken by the balloon as best they can! While you drift on the breeze the ground crew will be having their own adventure - the challenge of anticipating your landing spot. 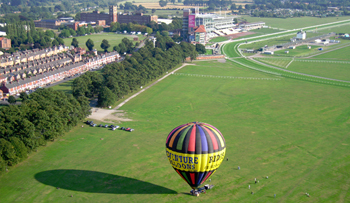 The hot air balloon ride is ready to commence as we take off from York Race Course – the "Knavesmire". 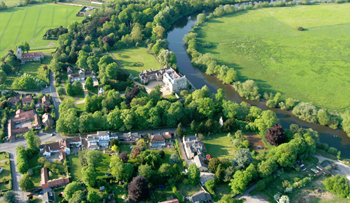 From the air you will see towns and villages, woodlands, rivers, farms and fields, all laid out below like a decorative map or "sprinkled from a toy box" as a passenger commented. One moment you might be hovering just above the treetops, gently brushing over the leaves, minutes later you might be soaring aloft. The minutes drift by like the countryside below but all-too-soon we approach the end of the flight. The Pilot will have briefed you about landing so don't worry - if the basket tips over when you land, it's much more fun. However, most of the time, the basket remains upright and it's a very dignified affair! The crew and willing volunteers will soon be packing the deflated balloon and equipment onto the recovery trailer. You will marvel at the extraordinary simplicity of a flying machine that has carried you over the countryside and left you with memories to make you smile as you toast the flight with a glass of chilled champagne. That is the thrill of Ballooning! The hot air balloon often lands upright but will sometimes tip over on landing. 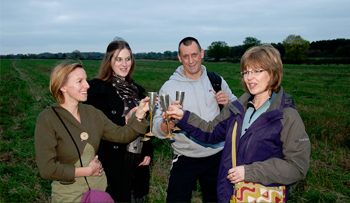 Celebrating your hot air balloon ride with the traditional champagne toast.